We would like to express a big THANK YOU to everyone who made this 27th edition of the Hardronic Festival a big success. First the audience who came in numbers, and all the talented musicians who entertained them for over eight hours, putting on a fantastic show! We'd like to thank the CERN Staff Association, the CERN Management, the Clubs Coordination Committee, the Mairie de Saint-Genis Pouilly , the IT and SMB departments, the Fire Brigade, the IR-ECO and BE-OP groups, and Carlsberg and Feldschlösschen, for their help and support. All the roadies who helped tirelessly install the whole equipment on Saturday morning, then set up and take down 13 bands on the two different stages during the concert, take it all down after the event, and bring it back to the locale the next morning; Connie and her team who ran the bar; Tom & Simon, sound engineers extraordinaires; Ina and the many other light system operators, most of them learning the job on the spot; Cyril & Thorsten for the logistics on Saturday; Pedro and Oscar for a great poster, webpage and publicity they’ve done on Young@CERN; Greg who firmly solved the access logistics and ensured that all people got their badges in time; Konstantina who organized a Kids' corner at the last minute, once it was known we could not safely operate a bouncy castle; Roxana who also at the last minute was able to put together a third food stand after the defection of one of the food trucks; Jon & Leonidas who fixed and monitored the electricity supply for the food trucks; CERN photo club for the pictures; CERN Running club for the tents... and probably some great people whom we are forgetting but who would deserve our written thanks - please forgive us! We're now looking forward to organize HARDRONIC'2019! The Hardronic Festival will take place on Saturday, 4th of August, with music starting at 5:00pm and ending around 1am. Full schedule available HERE. This year, the festival will take place on the Restaurant 3 terrace, at CERN Prévessin. 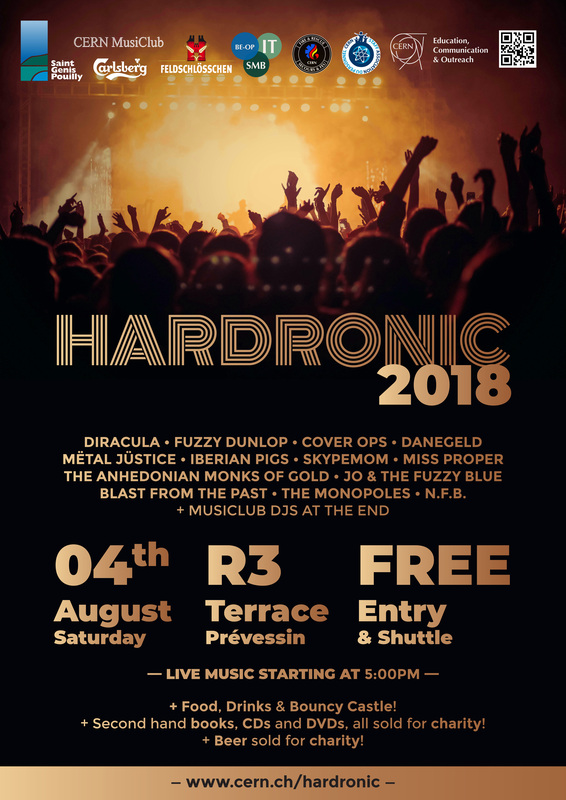 The Hardronic Festival is for EVERYONE and is FREE! Bring your co-workers, friends or family and enjoy this day. More info about access HERE. 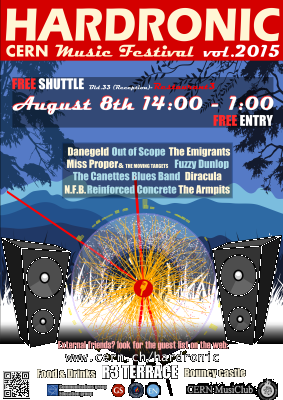 THIRTEEN of the finest CERN Music Club bands will perform. Click here for more information about the bands! Due to the latest security policy, access is now simplified: CERN people just need to bring their Access Card; all external visitors have to be registered in the Hardronic Indico event in order to be granted access. After registering in the event, please print the visitor access cards and take them with you. You will not be allowed to enter (both the shuttle and the Prevessin site) if you don't have the visitor badges visible with you. The rules for entering the Prévessin site with a vehicle are the same as any other day, this means that if you have not taken the necessary formalities to access CERN with your vehicle, then you will not be allowed to do so during the festival either, regardless of having an access card or being registered. Please bear in mind that passengers in an authorised vehicle will have to show their CERN access cards as well or be also registered in the event. If you are a visitor, please use the GLOBE Parking when you come on Saturday. You can find the parking rules HERE. Occasional visitors are, by default, entitled to a single (in-out) access to the Flagstaff Car-Park, but are not entitled to park in the P+R area. If they wish to access the Flagstaff Car-Park and the Globe car park again they must apply to Building 33, otherwise they will be refused entry. In case you don't have a car, we have good news! During the festival duration, there will be shuttles going periodically from Parking Globe/Mobility Centre (the same as for regular shuttle lines) to CERN Prevessin Restaurant 3 and back. There will be stands selling a fair variety of food and drinks. Animation for kids with Konstantina Fitrou from 17h30 to 18h30 and from 20h to 21h: Come and join her Air Band and support the CERN bands by playing along in the rhythm. Expect this and many other group games! Beer, secondhand books, CDs and DVDs will all be sold for charity. I work at CERN, can I join the festival? Yes, just bring your CERN badge to Prevessin site. I have friends visiting that want to go with me, is it possible? Everyone is welcome! To grant access to non-CERN employees, you just need to register your friends in the Hardronic Indico event. You can find the event HERE. What time can I go? You can go anytime, Prevessin site is working normally. However, the music is only starting at 5:00pm. The festival will end with DJs, which will be performing until around 1am. Full schedule available HERE. I don't have a car, how can I go there? There will be shuttles on a schedule (COMING SOON) which will do round-trips from CERN Meyrin to CERN Prevessin. This means you can go to Prevessin and return to Meyrin using shuttles. More details soon. I have a car, can I take it with me? The rules for entering the Prévessin site with a vehicle are the same as any other day, this means that if you have not taken the necessary formalities to access CERN with your vehicle, then you will not be allowed to do so during the festival either, regardless of having an access card or being registered in the event. Please bear in mind that passengers in an authorised vehicle will have to show their CERN access cards as well or be properly registered. I am a visitor and I have a car, what should I do? We suggest you park on the Globe parking and use the shuttle to go to/return from the festival. More info about parking rules HERE. Yes. There will be food trucks and other structures selling food and drinks. I am vegetarian, will there be any options for me? Yes. Options will be more limited, but we thought of you! Of course! There will be plenty of space for everyone and there will be animation and games (by Konstantina Fitrou) specially for kids. Geodude used Rock Smash... But it Failed, because Cover Ops do the Rock 'n Smash like no other. Danegeld is a classic rock quintet, specialising in playing your favourite 70's and 80's tunes loudly and often too fast. Once described by a random passer-by as "what's going on here then? ", the audience will be enthralled, shocked, and occasionally amused by their unparalleled stage presence (mostly due to the space taken up by having 5 members...). Tribute will be p(l)ayed, and no-one will be spared! What happens when a couple of antimatter scientists hook up with an LHC beam physicist and a sultry lead singer from Transylvania? Wait for it... Diracula. Undead at the Hadronic Festival 2017. You might want to send the kids home before you cut loose with Diracula... You've been warned. From the inner depths of the Iberian peninsula, our heroes were the target of some bizarre experiment to obtain the ultimate taste in curated meat. But something went wrong: instead, they developed terrible music skills, and are now ready to rock their way out of the slaughterhouse. Click for some extremely rare footage of two of them eating before a concert. Geneva’s legendary version of Spinal Tap meets Motley Crue brings back Big Hair 80s Metal one song at a time. Miss Proper is a cover band formed in 2009 in Geneva at CERN. Formed by a particle physicist, electronics physicists and engineer and an accelerator physicist. The band repertoire consists mainly of classic late 80's and 90's rock music, with some re-arranged modern pop songs thrown in. Energetic tunes, unexpected musical arrangements and lot of great fun guaranteed. Skype Mom originally formed to serve as in-house band for local Geneva improv troupe the Renegade Saints, but have since evolved into a full-fledged music machine. We're really just 4 dudes looking to have some fun while blending rock riffs with jazzy rhythms into something you can at least nod your head to like a salmon. An alchemical songwriting duo, these monks have emerged from their cave to present a strange apocalyptic blues in the vein of Tom Waits and Nick Cave. Coming from various music backgrounds, we like to share our love for old classics as well as fresh music. For this year’s Hardronic, we present a fusion of jazz, folk and rock upgraded to a sextupole experience!